Ack, I meant to post this yesterday and totally forgot. Huge apologies, because this thing looks great – so many fantastic artists are involved in this show! 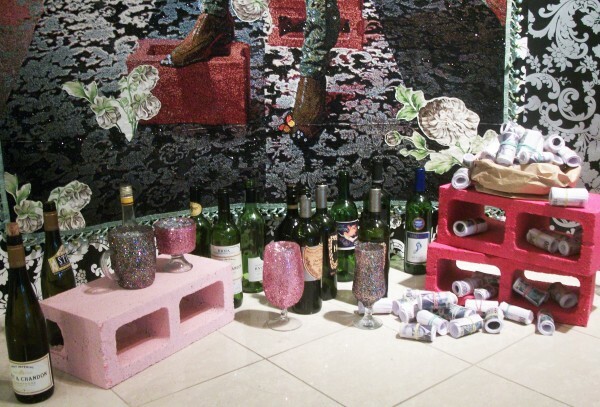 But luckily there’s still time for you to catch the first of an ongoing “Winter Experiment” at Monique Meloche Gallery if you hop on by the space TODAY, Saturday, at 1pm to listen to the talk between Ebony G. Patterson & Tumelo Mosaka taking place in the gallery. They will have treats and hot drinks (provided by Letizia’s Natural Bakery), and Duncan will be on site recording this and all the other upcoming talks for Bad at Sports’ podcast, so stop by, hang out, and say hi to your friends! The full schedule of events follows…. Patterson (Jamaican, born 1981, lives Lexington, KY/Kingston, Jamaica) will have a dynamic mixed-media installation that investigates Jamaican dance hall culture in the gallery’s window facing Division Street. Mosaka included Patterson in his 2007 exhibition Infinite Island: Contemporary Caribbean Art at the Brooklyn Museum of Art where he was formerly Associate Curator of Exhibitions. Recently, Mosaka has become the Contemporary Art Curator at the Krannert Art Museum, Champaign, Illinois. Pattersonâ€™s installation Gully Godz in Conversation-Conversations Revised I, II and III will continue through March 26 as our fourth on the wall project. Gunn’s (American, born 1980, lives Chicago) paintings, sculptures, and installations investigate the power and perception of pattern and light as well as the roles of spatial and cultural context to the assignment of meaning in contemporary art. Michelle Grabner, who is an artist, curator, writer and the founder of The Suburban in Oak Park, taught Gunn at the School of the Art Institute, where she is Chair of the Painting and Drawing Department and where Gunn received his MFA in 2007. After the conversation, follow us for the opening of Grabnerâ€™s solo exhibition Like a rare morel at Shane Campbell Gallery. Fain (American, born London 1980, lives Chicago), who is best known for his controversial public-performances and parades, recently taught the course The Parade Float as Guerrilla Art in Northwesternâ€™s Department of Art Theory and Practice. Stratton, the founder and Executive Director of local non-profit Threewalls, is intimately familiar with Chesterhill, OH, the location of Fainâ€™s most recent parade and the subject of his current project. Together they will discuss this project along with new contexts for art making and exhibiting. Shteynshleygerâ€™s (Russian-American, born Moscow 1977, lives Chicago) photographsâ€”portraits, still-lifes, landscapes, and interiorsâ€”display a historic sensitivity that is at once personal and political. Arts patron Waldburg-Wolfegg is on the Advisory Committee of the Museum of Contemporary Photography and the International Committee of the Renaissance Society, where Shteynshleyger had solo exhibitions in 2004 and 2007 respectively. Shteynshleyger will be previewing some of her new work in progress.